In 1917, working alone in a remote Swiss asylum, psychiatrist Hermann Rorschach devised an experiment to probe the human mind. For years he had grappled with the theories of Freud and Jung while also absorbing the aesthetic of a new generation of modern artists. He had come to believe that who we are is less a matter of what we say, as Freud thought, than what we see. Rorschach himself was a visual artist, and his test, a set of ten carefully designed inkblots, quickly made its way to America, where it took on a life of its own. Co-opted by the military after Pearl Harbor, it was a fixture at the Nuremberg trials and in the jungles of Vietnam. It became an advertising staple, a cliché in Hollywood and journalism, and an inspiration to everyone from Andy Warhol to Jay-Z. The test was also given to millions of defendants, job applicants, parents in custody battles, workers applying for jobs, and people suffering from mental illness—or simply trying to understand themselves better. And it is still used today. 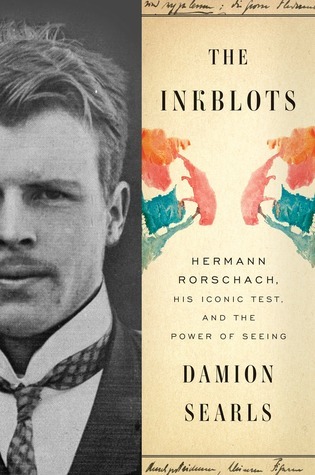 Damion Searls draws on unpublished letters and diaries, and a cache of previously unknown interviews with Rorschach’s family, friends, and colleagues, to tell the unlikely story of the test’s creation, its controversial reinvention, and its remarkable endurance—and what it all reveals about the power of perception. Elegant and original, The Inkblots shines a light on the twentieth century’s most visionary synthesis of art and science. I've been reading a lot of fiction lately and wanted something a bit different so when this book became available for review, it seemed like the perfect timing. Finding the time to read it, however, is another story for another day. Let's talk about Rorschach. The Good: This book reads as if you're talking with a friend. I love this author's style. Biographies can be dry but I never had that experience with "The Inkblots". In fact, I picked it up every chance that I got because, almost like a fiction book, I wanted to know what happened next. The Bad: The second half of the book is about what happened with the test after Rorschach's death and while interesting, I admit that it had a bit more trouble holding my attention. The Summary: If you're interested in psychology, psychiatry, or just really well written biographies, I suggest you pick up a copy of this book. I don't think that you'll regret it.